The Cutera Titan laser facelift technology uses a light source to create a thermal profile in the dermis with the goal of tightening facial laxity and stimulating collagen growth. The treatment improves skin tone and elasticity on many areas of the body including face, jawline, arms, chin, and abdomen. This treatment can be done on all skin types including tanned skin and causes very minimal discomfort. Some patients may see slight swelling or redness in treatment area but it is only temporary and typically goes away in a few hours. 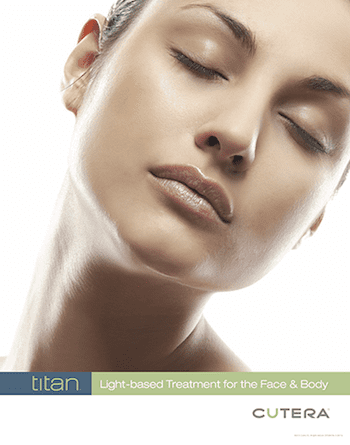 There is virtually no downtime associated with the Cutera Titan treatment.